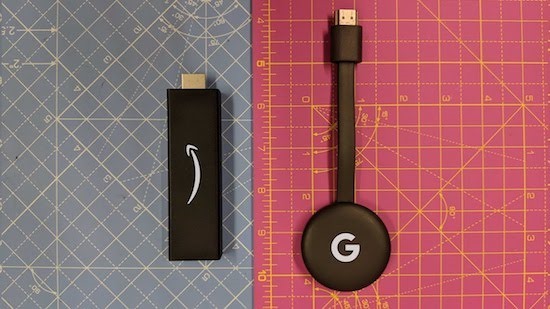 Last year, Google launched the Chromecast 3, alongside the Pixel 3, priced at $35, and after a few months later, Amazon released the next gen Fire TV Stick 4K priced a little bit more, at $49. Both of these streaming devices have their own perks. The new Fire TV stick supports 4K and comes with an Alexa remote, while the new Chromecast is still the king of screen mirroring. So, this got everyone thinking including me, which one has the edge of the other one? Well, to get to the crux of it, let’s see what's changed first. So, the Fire TV Stick 4K, now not only supports 4K, HDR and Dolby Atmos but the new Alexa remote has also come with volume controls. A much-needed upgrade over the previous generation Fire stick. On the other hand, not much has changed in the 3rd generation of Chromecast. The design is pretty much the same. The biggest highlight perhaps is that the Chromecast 3 can now do 1080p at 60 frames per second. So, if you are looking to buy a new streaming stick like the new Chromecast 3, or the Fire TV Stick 4K, then I’ve got your back. Before we begin, make sure you subscribe to this channel, we make videos on how to get most of your streaming device. With that being said, let’s begin. Both Chromecast 3 and Fire TV stick 4K look pretty much the same. I like the angular shape of Fire stick over the circular design of Chromecast, but honestly, the design doesn’t matter as both of these sticks are going to sit behind the TV anyway. What does matter is that both of these streaming devices also come with an HDMI extender so you will have enough room to utilize the other HDMI ports on your TV. But what really sets them apart, is the remote. Chromecast 3 doesn’t have a remote. The primary way to control your Chromecast is still your smartphone. Say, if you want to play something on Netflix or YouTube on Chromecast, you need to cast it from your smartphone. While casting videos is pretty easy for most tech-savvy people, jumping 10 seconds forward or backward is still a pain in small mobile screens. And the same goes true if you have a Smart TV that supports HDMI CEC. While your TV remote can’t be used as a fully fledged remote for Chromecast, you can pause and play, which is good enough. But these added bundles and hacks can never replace a dedicated remote of the new Fire TV stick 4K. A dedicated remote not only helps you find your favorite shows but also makes it a lot easier to jump a few seconds forward or backward while watching movies. Something which was a nightmare in Chromecast. What’s even better is that the new Alexa remote now has volume control and power button. So, even if you don’t have your TV remote lying around, you can easily control pretty much every function on your Fire stick without it. The new Fire TV stick is clearly the winner when it comes to having a remote, but what about the video playback options? Amazon claims the new Fire TV stick is 80% faster than the previous gen. We tested that claim in one of our previous videos, and while it's pretty accurate, the new Chromecast 3 is only 15% faster than the previous gen. Not that it matters much since both of them are equally fast. But, the game changer for me is that the new Fire TV Stick supports 4K along with HDR 10 and Dolby Atmos audio. While the Chromecast 3 can only do up to 1080p content at 60fps, which one mostly finds on YouTube and in gaming videos. If you are looking for a 4K experience on the Chromecast, then you will need to buy the Chromecast Ultra which is like $20 more than Fire TV stick 4K. It’s really expensive, if you ask me. Even if you don’t care about the remote and don’t have a 4K TV, one big thing to look for in a streaming device is content. Chromecast 3 still doesn't have any OS. All you get is fancy wallpapers and slideshows when the device is inactive. Though, you can set up a slideshow from your Google photos, which is pretty cool. But here is a bummer, you don’t have as much content playback option for Chromecast, as you get with the Fire stick. You get over 5,500 options, from big names like Netflix and Hulu to niche channels like Haystack TV and TV-optimized version of Spotify. Not to forget little amount of gaming your kids can play on the Fire stick. And that’s not the end. Since Fire TV stick is based on the Android ecosystem, you can pretty much sideload any Android app onto the Fire TV stick. We’ll come to that later, but in general, this just means there’s limitless potential for the Fire TV stick. Another bummer for me is that the Chromecast still doesn’t support Amazon Prime Videos. Even if you try to cast Prime video from your phone, all you get is a black screen with audio. Which is nothing compared to not having YouTube on Fire TV stick (which we all know can be easily bypassed with a third-party browser like Firefox). Though, this might change in the future, as Amazon has started selling Chromecast again. Remember I told you about the sideloading Android apps onto the Fire TV stick? Well, apparently, you can also run VPN’s on your Fire TV stick. Meaning, you can watch Netflix US and Hulu or your Fire stick, if you are into that kind of stuff. The process is a little bit tricky, so we have left a link for you in the description under the video. But even if you don’t want to do that, you can always change the DNS settings on your Fire stick to that of Smart DNS Proxy and remove geo-restrictions from streaming sites. When it comes to doing the same on Chromecast, well, things are not that easy. The new Chromecast, much like the previous one, comes with Google DNS hardcoded in it, so there is no easy way to change your DNS unless you want to muck about with your router. Similarly, you can’t even install VPN apps on Chromecast, since there is no OS in the first place. Fire stick is no competition to Chromecast when it comes to screen mirroring. In fact, there is no option to screen mirror in the new Fire TV stick 4K. However, you can get it working with the third-party apps like AirScreen. We tested the app with Android, iOS, Windows, and macOS. To my surprise, it works flawlessly. Both the audio and video had almost no lag. Although, these are just third-party apps that might stop working anytime in future, so if your major requirement is screen mirroring, Fire TV stick is no competitor. However, if it’s something you might need occasionally, the new Fire TV stick can do that too with 3rd party apps. And finally, there are minor yet important things that Fire stick can do and Chromecast cannot. For instance, you can attach a USB drive to your Fire stick with the help of USB OTG and then access its content with apps ES file explorer. We tried doing the same for Chromecast, but it didn’t work. Similarly, you can connect any accessory with your Fire stick like headphones, keyboard, or mouse, etc., which you can’t with your Chromecast. I often pair my Bluetooth headphones with my Fire TV stick. That way my girl doesn’t eat my ear off. On the other hand, Chromecast does screen mirroring, which you can still do with the Fire TV stick. Who wins? Well, the answer is pretty much clear. The new Fire TV stick 4K has the upper hand compared to Chromecast 3 in pretty much every aspect of streaming. The only reason to buy Chromecast 3 over Fire stick 4K would be when you need a dedicated device for screen mirroring. But other than that, the new Fire TV stick is worth the extra 15 dollars. That’s just our opinion. What do you guys think? Let us know in the comments section below. While you’re at it, check out our other videos that we’ve done on Fire TV. Also, check out Smart DNS Proxy if you want to unblock geo-restricted content on your Fire TV stick or even Chromecast. That way you can watch American Netflix and get a lot more TV shows than you normally would.